Every year since 1967, the Zilker Tree has acted as a beacon of holiday cheer on the south lawn of Zilker Park, its more than 3,000 lights twinkling in the winter darkness. This year marks its 50th anniversary, during which time it, along with the Trail of Lights, has become an entrenched part of Austin history and culture. The 50th Annual Tree Lighting ceremony is set for 6 p.m. on Nov. 27, and it burns brightly from 6 p.m. to midnight through Dec. 31. While Mayor Pro Tem Emma Long lit the tree for the first time in 1967, these days the honor goes to a local winner of a kids’ art contest. The Trail of Lights opens Dec. 10 and the lighted exhibits are viewable from 7-10 p.m. through Dec. 23. In the late 19th century, moonlight towers were a popular way to illuminate city streets at night, and were bright enough to light several blocks at once. In 1894, Austin installed 31 moonlight towers across the city. Today, the 17 that remain are the only working moonlight towers in the world. 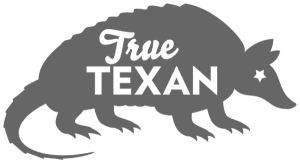 And, in 1970, they earned their designation as Texas State Landmarks, followed by their 1976 inclusion on the National Register of Historic Places in 1976. The Zilker Tree, known as the most recognizable moonlight tower in the city. Crews affix 39 streamers bedecked with blue, red, green, and yellow lights to a moonlight tower. The yellow light bulbs are strategically placed to enhance the pattern’s swirling effect. Like any good yule tree, there’s a glowing white star on top, 10 feet wide and composed of 150 frosted bulbs. The moonlight towers are iconic Austin artifacts, and it’s only fitting that they would play a role in the Zilker Tree tradition, which is beloved by Austinites both new and old. 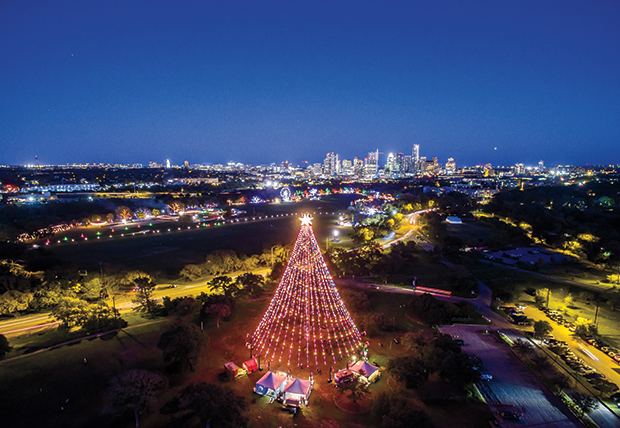 Generations of Austin families have made it a tradition to journey to Zilker Park to take photographs at the tree and spin beneath the canopy of light, which is 350 feet wide at its base. Recalls Shawna Renold, who also grew up in Austin, “We’ve gone every year since I was a child. I love looking at all of the light displays, taking pictures, and spinning under the tree.” When Renold’s twin sister Sharla Meranda visits Austin from Ohio, the whole family treks down to the Zilker Tree and the Trail of Lights to continue the holiday tradition. What began as a small “Yule Fest” in 1965 has expanded into a Texas-sized celebration of a growing and increasingly diverse community. The Trail of Lights, adjacent to the Zilker Tree, transforms the outer perimeter of the park into a giant holiday-themed light show. The merry masses enter the trail through a festively lighted tunnel, then follow one holiday scene after another – 40 tableaux, from famous Disney movies to Santa’s workshop. Food court vendors help set the mood with season-inspiring treats such as hot cider, cocoa, funnel cakes, kettle corn and more. The park’s trees wrapped with lights, and a small ferris wheel add the larger bright touches. The two million lights and tree-lighting ceremony aren’t the only attractions. there are numerous activities associated with the Zilker Tree and the Trail of Lights each year, including the Trail of Lights grand opening on December 10. Sporty types can preview the Trail on December 3 with the annual 2.1-mile Fun Run. Sunday, December 11, is UT Night, in which Universitiy of Texas at Austin faculty, staff, students, alumni, and fans are invited to enjoy the trail together in an act of school spirit. Heroes Night, December 13, honors members of the military and law enforcement, and families can come down on December 16 for a movie in the park.